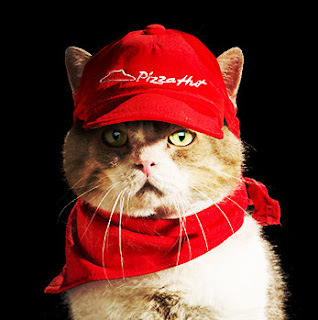 Introducing Tencho, Hime, Dora and Detch, the newest employees of Pizza Hut Japan. They even have their own store, where they answer the phone, greet customers, manage the money and make and deliver pizza. When they're in the mood. They also clean their shop by cruising around on a Roomba. Writing for AdWeek, Alfred Maskeroni admits he's not sure about the point of Pizza Hut Japan's new advertising campaign. But it certainly is cute and will attract lots of visitors to Pizza Hut Japan's You Tube channel. And maybe that's the point. Click on the link to check out the videos. But don't order a pizza. Pizza Hut Japan is quick to point out that it's all make-believe.